A police chief has said it would be "totally disproportionate" to blame disorder at a seaside town on the whole travelling community. Venues in Cromer, Norfolk, closed their doors on Saturday night after there were thefts and anti-social behaviour. Residents on social media had linked the disturbances to travellers who had arrived in the town on Friday. Norfolk Police Deputy Chief Constable Nick Dean said officers were treating the weekend's events "seriously". A taxi driver told a BBC reporter "travellers are rampaging the town" on Saturday night and staff at The Wellington pub said they closed after a group of 30 travellers became "rowdy". The chairman of Cromer Carnival, Tony Shipp, said children from the travelling group were "throwing objects". Mr Dean said: "Cromer is a very safe town, this is an isolated incident. "We can't deny a group of the travelling community were in north Norfolk at that particular time. "But to put the blame completely on the travelling community as a whole, I think is totally disproportionate." He did not comment on who he thought was to blame. Up to 25 travellers' caravans had arrived at the town's Runton Road clifftop car park on Friday. They have since moved on. Image caption Cromer's Chamber of Trade and Business said companies lost "thousands of pounds of trade"
Mr Dean said no arrests have been made but reported crimes were being investigated. Police were called to five incidents of theft, three from shops and two from local pubs where drinks were taken and not paid for. At about 23:30 BST, police were called to Cromer Social Club following reports a large group were there and refused to leave when asked. The group left when asked by police. Police received reports of shoplifting and "low-level" anti-social behaviour in the Cromer area. At about 17:00, officers were called to a pub after a large group of people refused to leave. Officers arrived and the group left. Officers were called at about 19:15 after reports people had taken drinks from a restaurant on Prince of Wales Road without paying. Police attended and drinks were either paid for or returned. Shortly after 20:50 police were called to a private bar at a caravan park following reports a large group had entered and refused to leave when asked by the manager. Officers spoke to the group who then left. 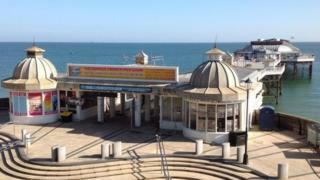 Cromer Pier's Theatre Bar was among the venues to close its doors. The town had been hosting its annual carnival week, which ended on Friday. It draws in about 250,000 people to north Norfolk, according to the organisers. Gary Dickenson, chairman of Cromer's Chamber of Trade and Business, said businesses "lost thousands of pounds of trade" but they made "absolutely the right decision" to close. North Norfolk District Council leader Tom FitzPatrick said the council served a notice on Saturday for the travellers to leave. Norfolk Police said they had left the county and were thought to be in Colchester, Peterborough and London.